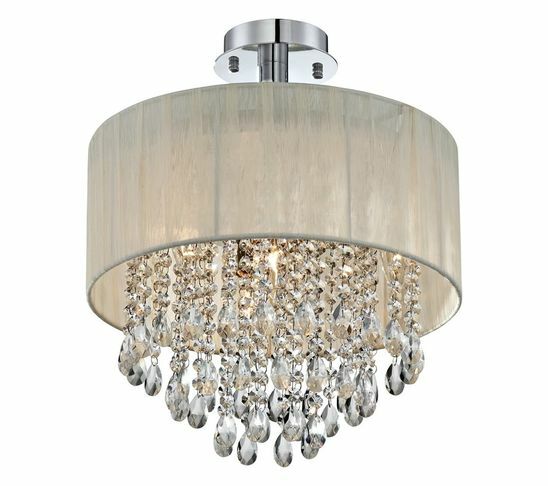 I'm sure you've all seen the drum shade lights with crystals hanging from them. I love them! They are everywhere right now. I've seen them priced all the way from right under $100 to right under $1,000. 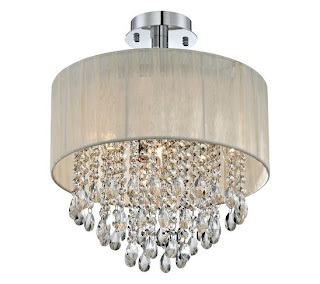 The one below is priced at $199.99 at Lamps Plus,. I was determined that I could make one for much cheaper than that. It took a while to work out the details, but with a little help from my mom we were able to come up with an idea using common materials. Below is what you'll need. 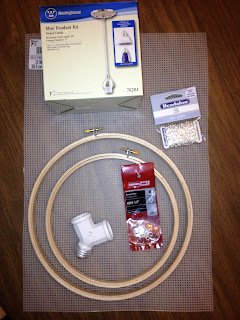 *There is also a double light socket pictured and some small hooks but we didn't end up using those. 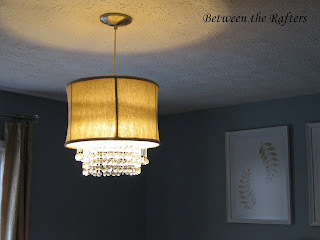 Here are the Steps to make your own DIY Drum Shade Chandelier with Crystals. 1. You'll be using the inside piece of the embroidery hoops. In other words, the solid wood piece. 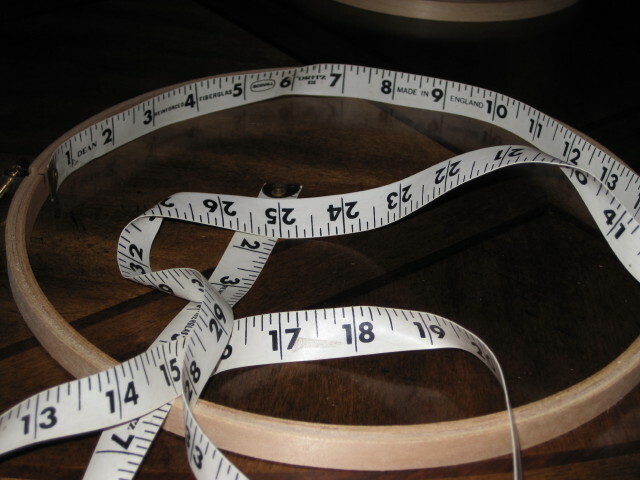 Take a flexible tape measure and measure around the inside of each of your hoops. Divide the measurement by 3 and place a mark at each division. 2. Cut your plastic embroidery canvas to the height you want. I cut to the height of five squares. Then cut to the length you need for the outside of each of your embroidery hoops. 3. 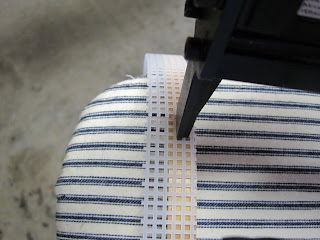 Staple your cut plastic canvas to the outside of each hoop. 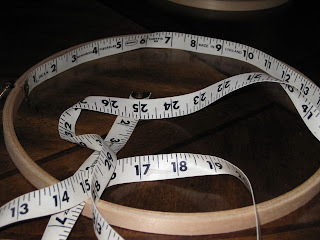 Remember you are stapling to the outside of the solid wood piece of the embroidery hoops. 4. Determine the length of your chains. You will need 3 chains of the same length for each hoop. The SMALLER hoop will have the LONGEST chain. The chains will be attached to your embroidery hoops with the plastic canvas. 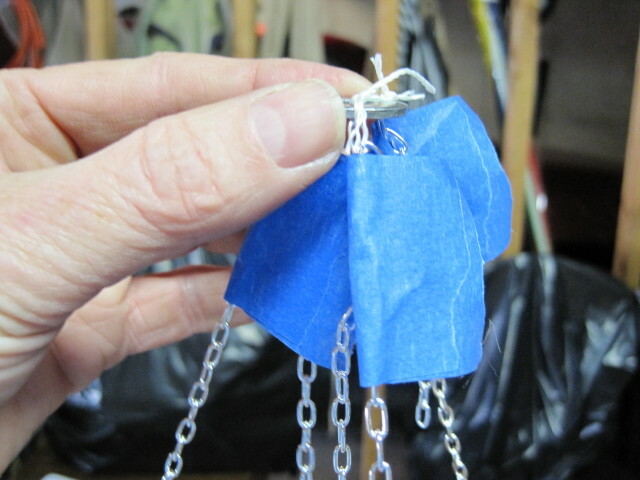 Your crystals will be attached to the plastic canvas so the length of your chains will depend on the length of your crystals and how much of them you want showing from underneath the shade. 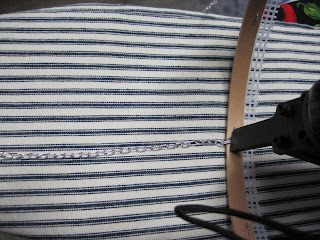 Once you have determined the length of your chains attach them to the INSIDE of the embroidery hoops on each of the the marks you made. When you cut your chain be sure to give yourself a little extra in case you mess up. 5. Take the three chains and tie them to one of the flat washers with string. Do this for each hoop. The painters tape is holding the extra chain down. 6. 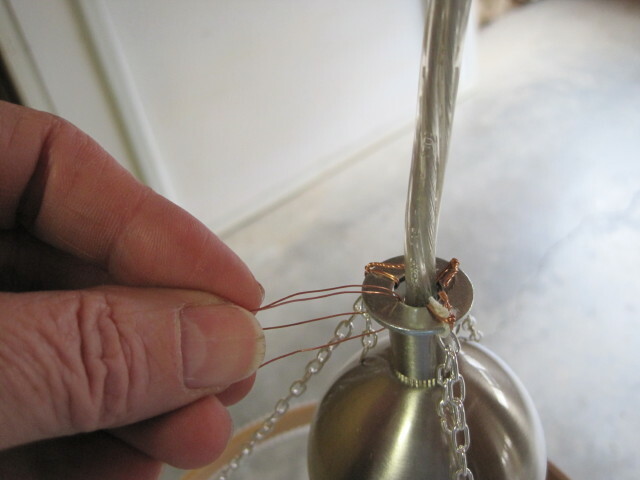 Take the cord of your pendant lamp and put it through the washer with the smaller hoop attached. Next take your cord and put it through the washer that is attached to the larger hoop. 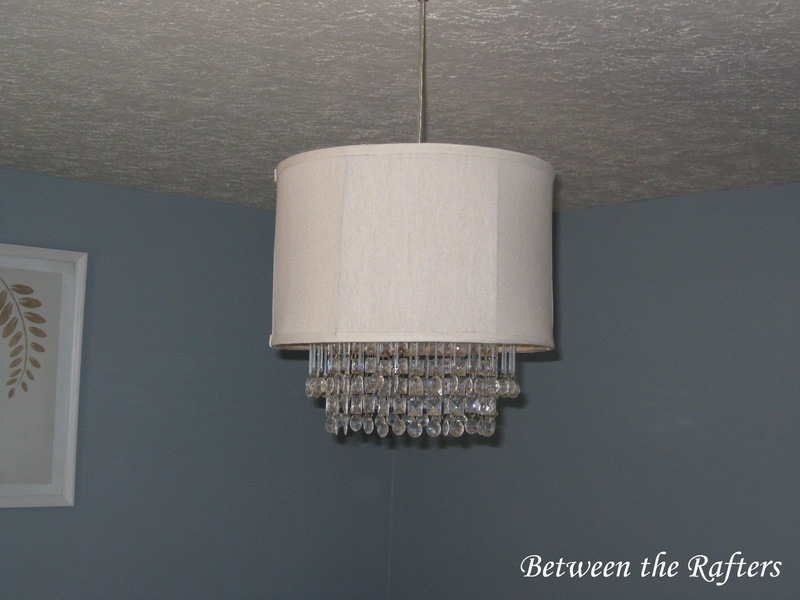 Then you'll want to put the cord through the middle of your shade. 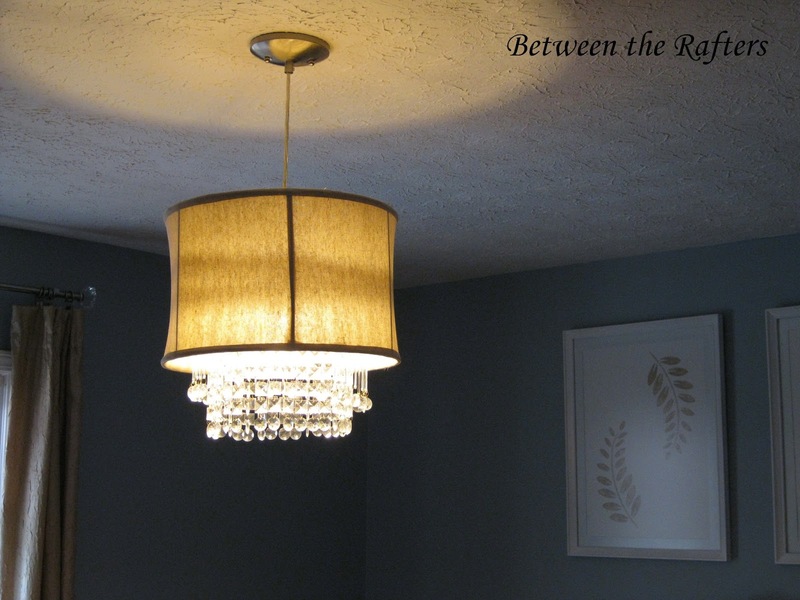 You'll want your light to be hanging at this point (not on the ceiling though). We had ours clamped to a board hanging between saw horses. 7. 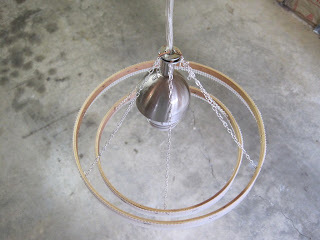 Take two of your chosen crystals and attach to the respective hoops so you can make sure the lengths are where you want them. 8. Once you have the lengths where you want, you'll need to disassemble your creation. Take a piece of thin wire and attach your chains to your washers. Cut off the excess chain and your string. 9. Reassemble. 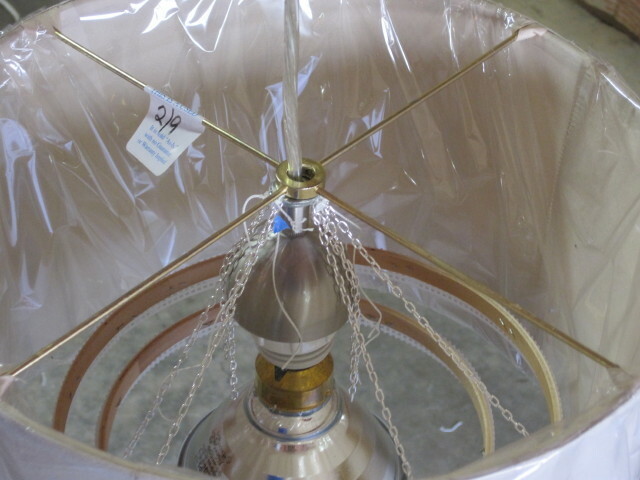 Small hoop, large hoop on the pendant cord. (Here is a picture without the shade.) 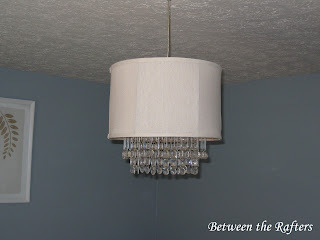 Add the drum shade to the assembly. 10. Hang your pendant assembly from the ceiling at your desired height. 11. Hang your crystals from the plastic canvas. 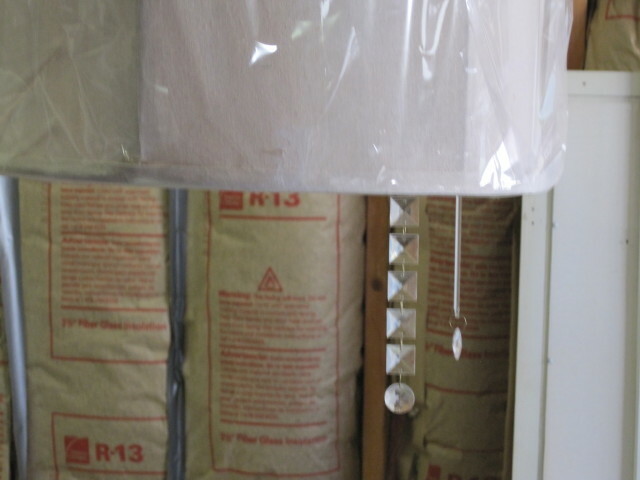 We used Christmas decoration hooks to make things easy. 12. Sit back and enjoy your creation!! 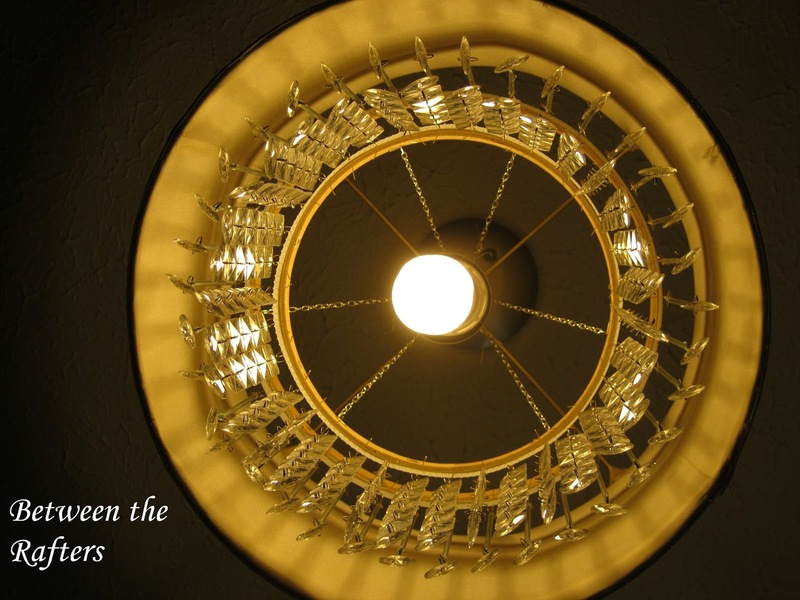 When the light is on you can see a slight shadow from one of the hoops. I don't think this is a drawback as it's not very noticeable unless you are looking for it. In some of the shots below it looks like the hoops are hanging crooked but this is just the angle of the pictures. If you divide your hoop measurement into three, make your chains even, and hang your crystals around so the weight is evenly distributed, they will hang straight. ** After we got all of the crystals hung from the plastic canvas we discovered that the weight of the crystals had brought the hoops down farther than we originally desired. We solved this by taking a few lengths of the chain and tying them to each other with a piece of the wire. I estimate the total cost of the project was a little over $30. Good job! I am impressed that you are able to make it that nicely with little cost! Keep up the good work! What a great idea. 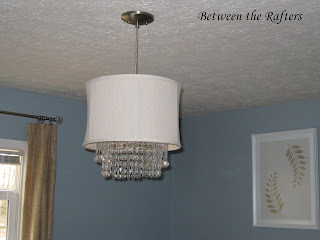 I love this style of light fixture. I would have never thought to try to make it. Great job. 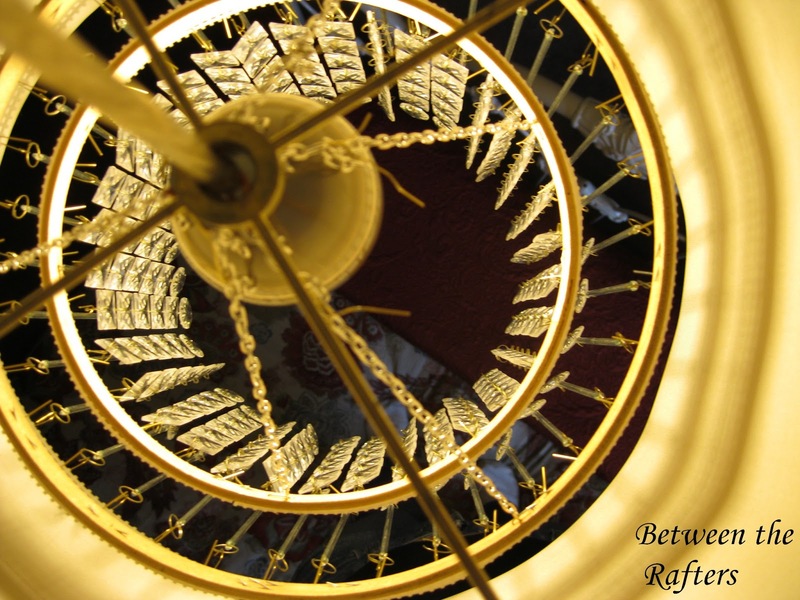 I'd love it if you would share this on my link party. Thank you Lauren! I'm now linked up to your party. What a really fabulous idea! 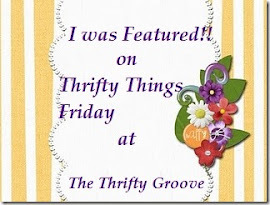 Thank you so much for sharing, I am featuring today at my party! thank you so much, I have been searching for months, and this was the best instruction. You are the best. Thanks so much! Good luck with the project! Hi! For 40 hours a week I work in the corporate world, but in my free time I'm a passionate furniture refinisher. I love to take old, unloved, or otherwise discarded pieces and turn them into something beautiful. I'm proud to say that almost everything I own is second hand.